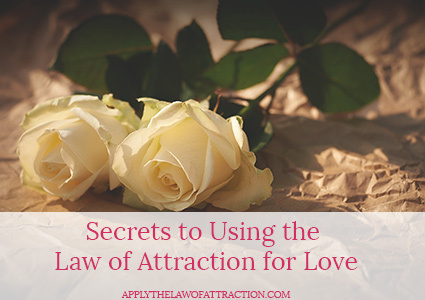 Using the Law of Attraction for love and relationships works whether you believe it will or not. You don’t have to be in a place where you are sure you know how to use the Law of Attraction to manifest love. You just have to remember that the Law of Attraction is about your thoughts. Like thoughts attract like things. 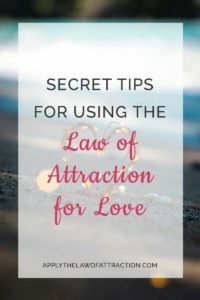 When using the Law of Attraction for love, you have to stop focusing on what your love life or relationships are like now. If you focus on how things are now, your thoughts will be filled with what is…and the Law of Attraction will give you matching experiences. If you think that you're lonely or all alone in the world, the Law of Attraction will bring you more loneliness. If you're frustrated with your love life, the Law of Attraction will bring you more frustration. If you think that you'll never find love, the Law of Attraction will bring you more instances where you don't have love. Don’t look at your relationship as it is now, but visualize it and mentally picture how you want it to be. Live as if it already is reality. Do the things you would do if you already had the relationship you want. Go on that vacation you've always wanted. Take those cooking classes. Sign-up for a massage course. Throughout all of this, remember to love and respect yourself so that you can attract someone who loves and respects you. Focus on how wonderful you are. Even if you can just focus on one thing that’s good about you, that's okay. Keep focusing on it and the Law of Attraction will give you more things that you like about yourself. And when you manifest your love, or if you have a relationship now that is a struggle…focus on what you appreciate about the other person. Don’t complain about him or her. It will only give you more things to complain about. And always remember that love is just a feeling. You’re the only one who can generate it, but your ability to generate love is unlimited. Love your life. Love yourself. Love everything you can. The more love you send out, the more will come back to you. I believe in law of attraction cause my experience in many years show me that it’s work. But now I have some problem. It’s about my relationship with my ex girlfriend. Last year LOA broung her to me . everything is so sweet and perfect! We spent all day and night together. it’s about 6-7 month . finally I think she was bored me.We quarrel many time and it’s not my mistake . so I try to make her happy but she leave me and said don’t bother her, don’t talk to her forever and said we weren’t a lover or a friend .many words from her make me cry.It’s very terrible. I ‘m praying and still use LOA .in 2 month since we broke there is a good sign.She initiates to contact me ..talk to me ..add friend my facebook…. apolpgize me…and ask me to still be her friend. And I’ve known she broke her new boyfriend! I observe that she try to greet me in many time but i ignore her. Deeply in my heart. I still love her and want she comes back to me.I’m confused..sometimes I think I can forgive her but tell you the truth I can’t forget what she said and what she did to me. i want her to reconcile me..but she doesn’t do anything more than that i tell you….if she do more than that i think we can make a new relationship . Please tell me how i can do i think my heart hasn’t energy so..confused ! Thank you very much for your advice. I’m very greateful.Your words make me feel clear and peaceful.Now i know “forgive & forget” two things i need to do now if i want to have everything. Every article in this website is very excellent and magnificent and you are very nice ! I love you Elizabeth ! I’m sure i will purchase your book.I want to read it now ! GOODBYE & TAKE CARE ! I started worrying a few months ago and it is like even though I never said anything to him it caused him to pull away. One day he is all lovey dovey the next distant. I really want to change this and based on my circumstances am kind of unsure how to proceed. I was wondering in your book you said you can change a relationship to make it better. But am unsure how since our relationship is a long distance. I keep trying to focus on how I want things to be and I start to feel sad because it makes me think of how good things were. I usually am the one who contacts him first. I wonder if I should just stop contacting him and let him miss me. From your site I have seen manifesting a relationship when the person lives somewhere else, but haven’t noticed any information on someone who is already in a long-distance relationship. I am not sure if I just apply the same techniques? I am sure you are very busy, I was wondering if you could give me a few pointers based on my circumstances? I really appreciate any input. I see what you mean. I was looking at distance as an obstacle. I notice that when I started to worry, that is when he started to pull away. Like one day worrying, fearing the next I would be optimistic trying to create with my thoughts. Up and down like a yo-yo and that is when the hot and cold pattern with him seems to have started. Whenever I would worry or fear even though I was so upset I kept changing the thoughts to a positive thought even though I was feeling bad. When I look at it and from things I read on your site it is almost as though it created confusion and a hot cold pattern with him. I was also wondering as part of my creating with him I want to be with him married. Does one see him asking me to come there or do I need to see it as being there with him already? Why not see yourself as being married to him? Does it matter how it happens so long as it does happen? HI Elizabeth,I would like to know. if she date someone else ,can I apply the law of attraction for get her back or make her love me again. Does the law of attraction work if he’s with someone else? My ex-guy lives in another country and he’s living with this girl now who he’s got a kid with. Can the law of attraction work for me in these circumstances..?? ?